The audio recordings are enough to make a homeowner cringe. For the first time, New Yorkers are hearing the secretly recorded conversations of oil truck drivers, as they plot to steal from unsuspecting customers. Video and audio recordings obtained by the I-Team from recent law enforcement investigations show heating oil truck drivers at times blowing air instead of oil into customers' tanks in a scheme called "shorting." Customers routinely got deliveries of 10 to 20 percent air, but paid for 100 percent of the oil heating delivery bill. The stolen oil remaining in the fuel trucks is then sold on the black market, according to a home heating oil delivery driver who asked not to be named but decided to speak out to the I-Team, saying too many customers were getting ripped off. The I-Team also obtained law enforcement recordings of drivers, dispatchers and supervisors having brazen conversations about how hundreds -- or even thousands -- of gallons of oil can be stolen during a delivery. Kings County Hospital was also among the customers victimized, according to the tapes obtained by the I-Team. Officials said it has been a mess for decades. In 2015, nine companies and dozens of workers were arrested with many pleading guilty in a heating oil theft ring. In that case, 58 trucks were seized -- with 47 rigged with switches and compartments enabling drivers to pump air instead of oil through the hose. Dan Brownell, who runs the city’s Business Integrity Commission, said the problem is so widespread that the NYPD couldn’t arrest it away. The former prosecutor said regulation is needed to stop the grifts and that laws similar to what was done in the once mafia-plagued garbage hauling industry are essential. Officials said "shorting" isn’t the only scam. Insiders tell us another dirty trick of the trade is called "blending." 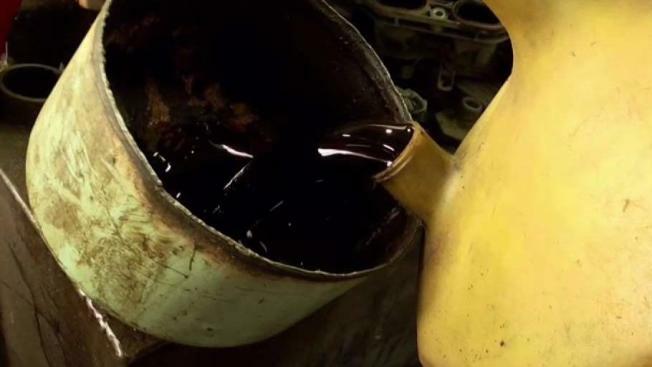 They said that is when good heating oil is removed from a heating oil truck making room for waste oil - like used motor oil - to be secretly mixed with the remaining heating oil on board the truck. The heating oil that was removed is then sold on the black market, but customers received and got billed for regular heating oil, not the dirty blended fuel pumped into their buildings. “And for that matter maybe repeatedly,” he added. Some forms of blending are allowed. Clean recycled waste oil can be mixed with heating oil, providing a legal product. But according to Wachtel, many firms don’t disclose they are delivering so-called blended oil products. He compares those to ordering a high-end drink, but the bartender waters it down -- or worse, “uses rubbing alcohol in 30 percent.” Wachtel claims dirty, unrecycled waste oil – like used motor oil - is still being blended by oil and trucking firms due to the profitability of the black market. Investigators said some who pleaded guilty to shorting have given information about ongoing dirty waste oil blending schemes. In his lawsuit, Wachtel obtained driver logs and company records that appear to show up to 30 percent of adulterated oil was delivered to some buildings. Lawyers for several companies responded in the class action suit saying that mixing some recycled oil is legal and deny having delivered adulterated oil or waste oil. They alleged Wachtel’s claims of fraud and abuse are unfair and exaggerated. Rocco Lacertosa, the CEO of the New York Heating Oil Association said most companies are honest, with just a few bad actors. But the anonymous deliverer said the abuse is bigger than most believe. He said some companies improperly make millions, while drivers can earn and extra $1,000 a week. “There’s a big problem here,” said the driver.